There are no upcoming events at this time. Please check back at a later date. Many things can be said about the performing arts. If you're interested in attending an exiting dance event that will allow you to get up close and intimate with the performers, then you'll need to check out a Tango performance. You'll experience the art of Argentine Tango from your close proximity to the dancers as they perform. Additionally, performing dance events sponsored by Tango L'amore are especially designed so you can feel what the performers are feeling, and that is,..
"The music, the movement, the intimacy, and the creative conversation between a man and a woman!" Performing dance events require the help of a professional event planner who has knowledge in the process of planning, inviting and setting up the entire event. If you have plans for a performing dance event involving Tango or other variations, call Yulia at Tango L'amore. She will accommodate your audience and performers and will assist in all stages of your next Tango performance event. Yulia and her partner are available for performance entertainment events such as private parties, stage shows, corporate events, and other organized events in Santa Barbara, California. Spend time diving into the best version of yourself and your life through guided meditations, movement and writing. 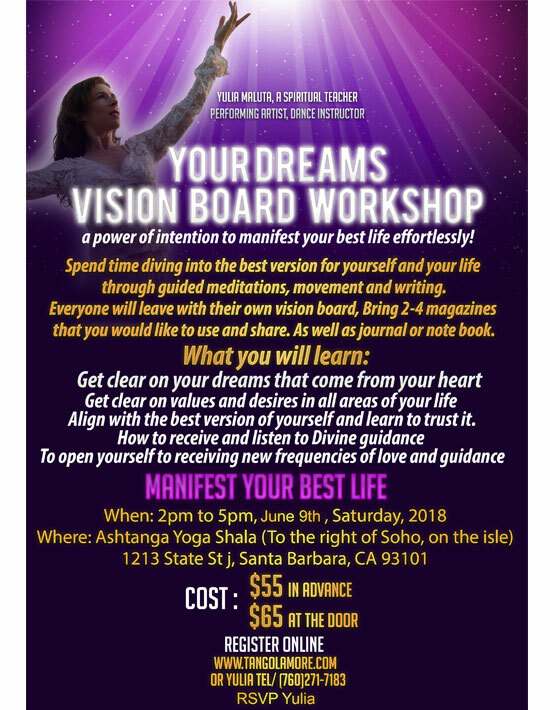 Everyone will leave with their own vision board. Bring 2-4 magazines that you would like to use and share, as well as a journal or notebook. 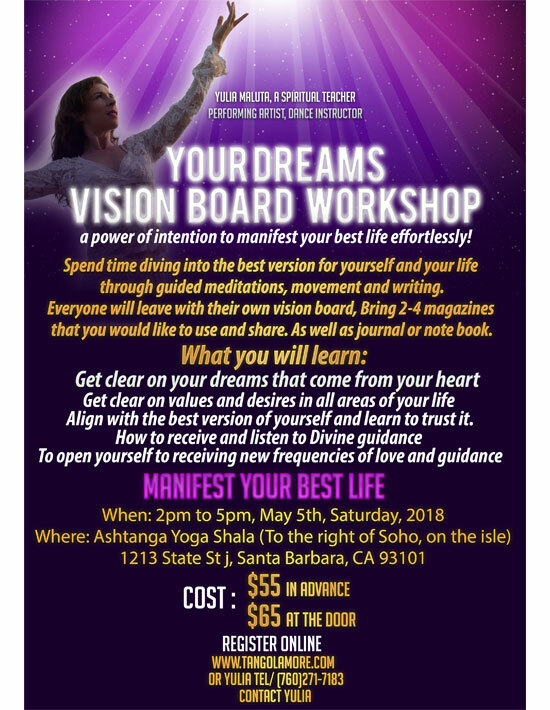 Get clear on your dreams that come from your heart. Get clear on values and desires in all areas of your life. Align with the best version of yourself and learn to trust it. How to receive and listen to Divine Guidance to open yourself to receiving new frequencies of love and guidance. 1213 State St. "Suite J"
Cost:$55 in advance, $65 at the door. Register online at www.tangolamore.com, or call Yulia at (760) 271-7183. 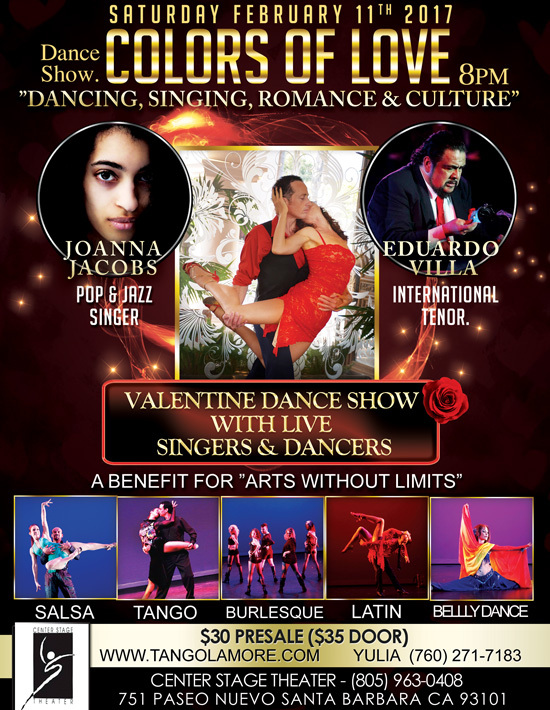 Join us for unforgettable celebration of love (a Valentine dance show) with local and LA dancers and singers ranging from Latin, Salsa, Belly Dance, Burlesque, Samba to Argentine Tango and more. Colors of Love is a Valentine Dance Show featuring professional dancers and singers, together they blend their unique talents into powerful expression of different colors of human experience. What you will experience mystery, vivacious energy, tender sensuality, exquisite beauty, infectious passion and being evoked and transformed into a new sense of aliveness. Indulge your senses, heart and ears with delicious magic of dance and live music in a style of Barbara Streisand, Jazz and Love songs sung by fabulous Meghan Monroe. "Meditation Can Be Fun, Enriching & Fulfilling"
June 13th and 20th, 2017. Conscious movement and meditation goes hand in hand together. When we learn to move with grace with life and at the same time be still and listen, we can be guided by our life force, intuition and Love rather then reactive instincts. 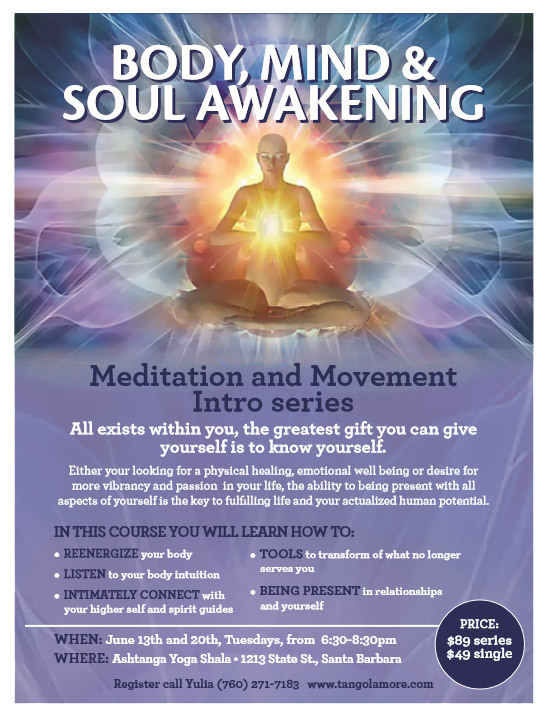 Get introduced to different ways of meditating that suits your type: movement meditation, sensual meditation, reflective, healing and traditional yogic. Plus: Channeling messages from Council of Light. As some of you may know I have being a dance teacher and performing artist and underneath all of that I have being guided by awakening and my intimate relationship with Spirit into who I am today. It took a lots of years of ripening and getting ready to finally say yes! I am ready to teach spiritual awakening and awareness through whatever form it takes: dance, performing arts and spiritual workshops. I have being doing that "secretly" (lol) all alone but this workshop is a define moment for me to claim what my life is all about and what I learnt that saved and helped me to live an enriching life guided by Love and start putting more of who I am out there to help others to be more of their magnificent selves. And I love to do that in the most fun and deep way. "Colors of Love and Sensuality"
On February 11, 2017 at 8:00pm. I will present my newest production called "Colors of Love and Sensuality." The production will be held in Santa Barbara at Center Stage Theater. ''Colors of Love'' is a Valentine Dance Show featuring professional dancers and singers, together they blend their unique talents into powerful expression of human experience. Join us for unforgettable celebration of love with local and LA dancers and singers ranging from Latin, Salsa, Burlesque, Samba to Argentine Tango and more. Indulge your senses, heart and ears with delicious magic of dance and live music in a style of Lara Fabian, Andrea Bocelli, Barbara Streisand and more. 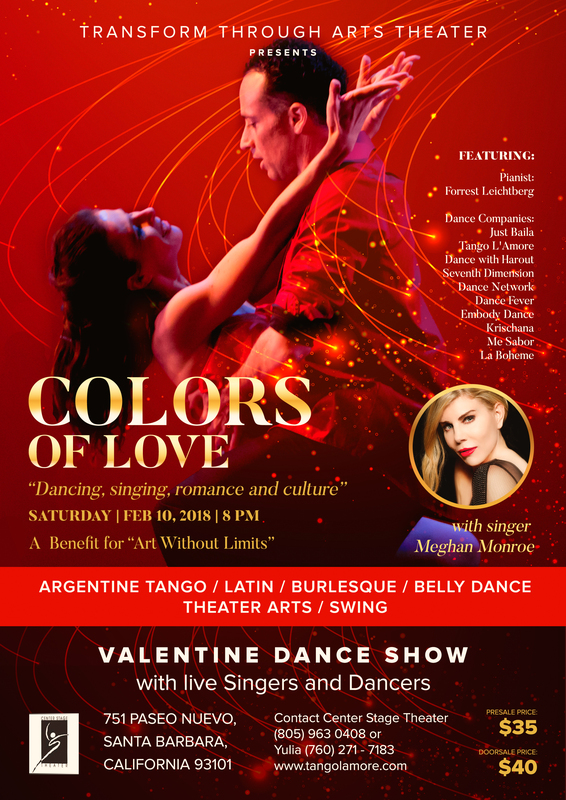 "Colors of Love - a Valentine Dance Show"
A Unique Event With Flavors and Songs From Italy and Spain weaved with hot Argentine Tango, Latin, Ballroom Dancing, Belly Dance, Aerial and Contemporary dancing. 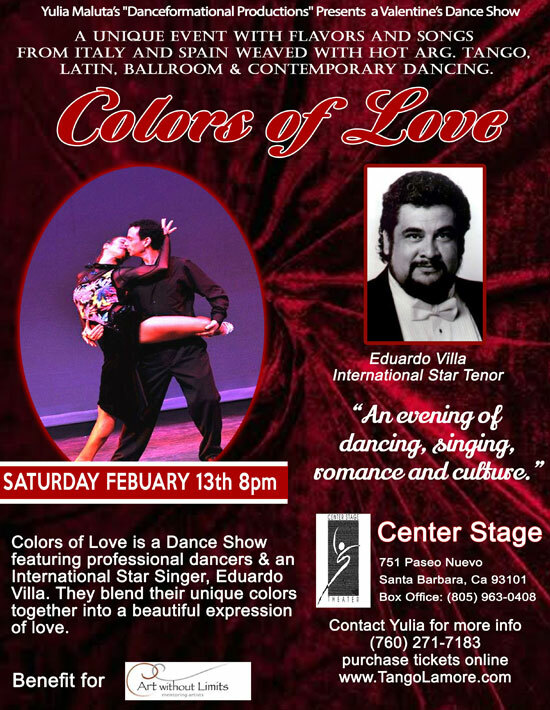 ''Colors of Love'' is a Dance Show featuring Professional Dancers an International Star Tenor Eduardo Villa. They blend their unique colors together into a passionate expression of love. Plus, Special guests incredibly talented performing Artists. Tickets can be purchased online $30, to at the Center Stage Box Office. 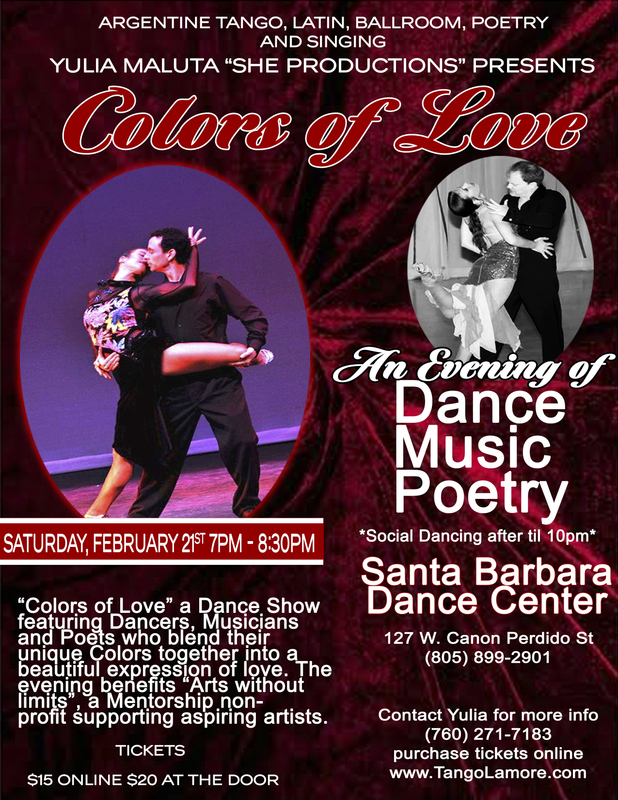 Purchase the tickets for ''Colors of Love'' Dance Show online and receive 1/3 price of the Lesson on February 14th. Benefit for ''Arts without Limits'' non-profit. This event will be followed by ''Be my Valentine Wine, Tango and Salsa Lesson'' on February 14th. 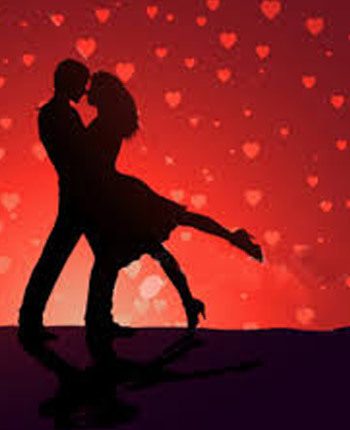 Enrich your Valentine day with some of the hottest and intimate dancers Salsa and Tango for total Beginners. World Class instructor Yulia Maluta will make learning Salsa and Tango fun and enjoyable. NON MEMEBERS ARE WELCOMED AND WILL HAVE ACCESS TO THE CLUB THAT DAY. 520 Castillo St, Santa Barbara, California 93101. "Art of Intimacy in Relationships Workshop"
Learn to express Love through your whole being and flow with life and your relationships. Singles and couples are welcomed. No dance experience is necessary, just willingness to move. For singles and couples. "Colors of Love - Benefit Dance Show"
"Colors of Love" Dance Show featuring Dancers, Musicians and Poets who blend their unique Colors together into a beautiful expression of Love. The evening benefits "Arts without Limits" a mentorship non-profit supporting aspiring artist. Produced by Yulia Maluta in collaboration with Derrick Curtis. 7pm-8:30pm Dance Show "Colors of Love"